As soon as you get engaged, everyone wants to know, how did it happen? What’s the story behind popping the question? 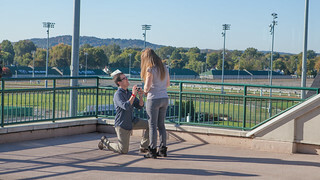 At the Kentucky Derby Museum we have the perfect way to get down on one knee for a memorable engagement moment that will last a lifetime! Our most recent couple got on the road to “I do” on a beautiful October morning. Eric Hollis and Sarah Frazier have been together a little over four years. They met during college at the University of Kentucky. Eric said they’d both been to the Kentucky Derby before and spent time at the races with her family, so it was already a location they associated spending good times together along with family and friends. Eric had been searching around online for ideas when he came across the Kentucky Derby Museum’s special engagement packages. “I’d been really thinking about it. How to make it special and how to surprise her,” he said. He succeeded! On a beautiful fall day, Eric asked Sarah to marry him, with the historic Twin Spires as the perfect backdrop, completely taking his bride-to-be off-guard. Our photographer captured the big moment for them and provided photos to the couple shortly after their engagement. Sarah’s parents were also on hand to witness the big moment. “I’ve been here several times, growing up in Louisville. Now it’s even more special, having been proposed to here,” Sarah said. We have so many unique ways to propose, from private tours to the perfect location to get down on one knee to Winston, our miniature horse, providing assistance with the big question. Check out our engagement packages for yourself today!